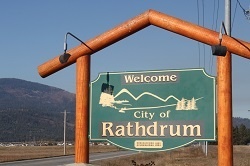 Rathdrum used to be a small farming town in the Valley north of Post Falls and Coeur d Alene. It is now growing and a bedroom community to both of those cities as well as Spokane WA. Sitting at the base of Rathdrum Mountain, it is a beautiful town.